Professional investors are betting against Europe at a more extreme level than we've ever seen before, based on one measure. And as I shared yesterday, that tells us a major rally in European stocks is about to begin. Today, I'll share why this won't be a flash in the pan. Instead, it'll likely be a multiyear boom that dramatically outperforms what we see in the U.S. Sentiment tells us a European boom is possible. And low prices tell us how high the market could rally. Our upside from here is huge... because European stocks are dirt-cheap right now. This is a simple valuation tool that tells you how cheap or expensive a stock is relative to its assets. A high P/B ratio signals stocks are expensive. And a relatively low P/B ratio shows stocks are cheap. Today, European stocks are trading for a P/B ratio of 1.6. That's dirt-cheap compared to the P/B ratio for U.S. stocks... They trade at a P/B ratio of 3.4 right now. Said another way, European stocks trade for less than half the price of their U.S. counterparts. We can also see today's value opportunity through the price-to-sales (P/S) ratio. It's another easy way to know if you're paying too much for a stock. Right now, European stocks trade for a P/S ratio of 1.1. That's a 50% discount to the U.S. market, which trades at a P/S ratio of 2.2 today. European stocks are a great value any way you slice it. And based on history, we can expect them to outperform their U.S. counterparts over the next decade. European stocks turned out to be the major winner over the next four years, returning more than 200%. And remember, the U.S. saw a fantastic bull market from 1996 to 2000. 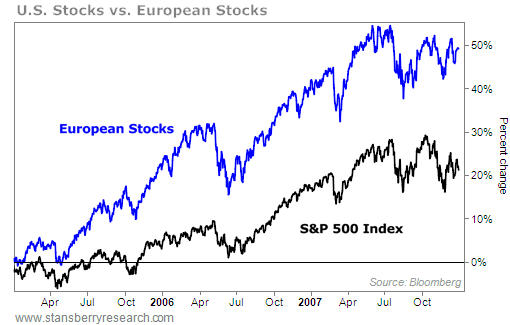 You see, European stocks have underperformed U.S. stocks in four of the past five years. And history says the story will soon flip on its head. As I showed yesterday, investors are betting on lower European stock prices at extreme levels. They believe these stocks will continue heading lower. And that means the opposite will likely occur. Plus, European stocks are a fantastic value right now compared to U.S. stocks. After years of underperformance, European stocks will likely crush their U.S. counterparts in the years to come. Triple-digit gains are possible as this situation plays out. One way to take advantage of this opportunity today is through the SPDR EURO STOXX 50 Fund (FEZ). This exchange-traded fund tracks the 50 largest stocks in Europe. By buying shares of FEZ, you're buying the blue chips of European stocks. It's a simple, one-click way to take advantage of the huge opportunity setting up in Europe. I urge you to check it out. As Chris says, investors may be better off putting their money to work outside the U.S... at least over the next decade. 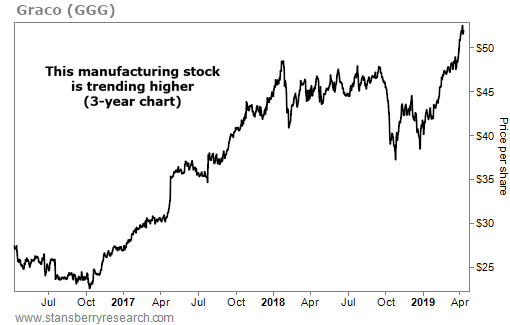 Catch up on his full essay on Europe from yesterday's DailyWealth here: It's Time to Get Money Out of the U.S.
Investors around the globe are finally starting to pay attention to another foreign market... marking a major shift from last year, when fears dominated the news. And recently, a major investment bank even got on board. Get the full story right here.